Almost five years ago, a pair of abandoned, decaying warehouses on Old Louisville‘s Garvin Place caught fire. The quiet, forgotten expanse of street sits just north of the Oak Street commercial corridor, but then, prospects for the properties looked grim. 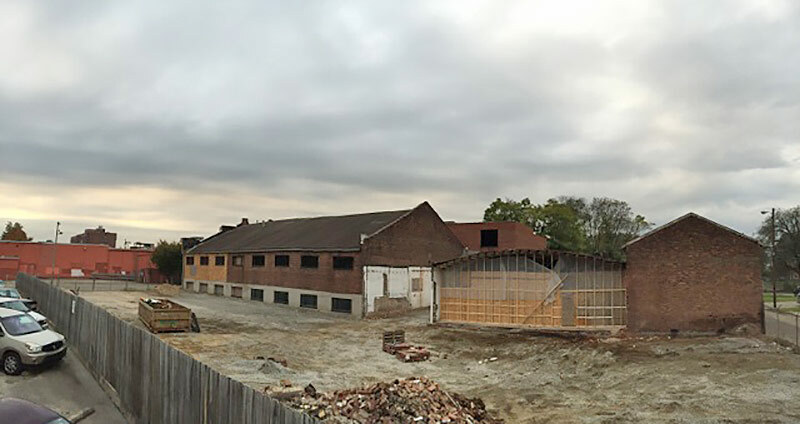 Fast forward to 2014, and these Garvin Place warehouses are back in the game, with renovations underway to convert them into high-tech offices for Louisville-based energy and commodity analytics company, Genscape. Right now, the buildings are completely gutted. The brick walls will be power-washed but the graffiti on them will remain in place. The large spaces inside are divided by multiple levels that create a sense of privacy and playfulness inside the warehouses. The walkability of Louisville’s densest neighborhood doesn’t hurt either. “Our CEO, Matthew Burkley, who moved here from London, bought a house in Old Louisville—one of the beautiful old brick houses,” Edwards said. “He could not believe the price that he got it for and has totally renovated it to be in keeping with the turn of the century era. He will be able to walk to work.” She said several other families live around Central Park and will be able to walk as well. Genscape plans to move into their new offices in November 2015. The company currently employs 100 people in Louisville, but expects that number to grow to 180 in the next few years. The new offices can accommodate up to 300 people. Genscape also has offices in Amsterdam, Boston, Boulder, and Houston, each with 30 to 60 employees. Genscape was founded in 2000 by Sean O’Leary and Sterling Lapinski.